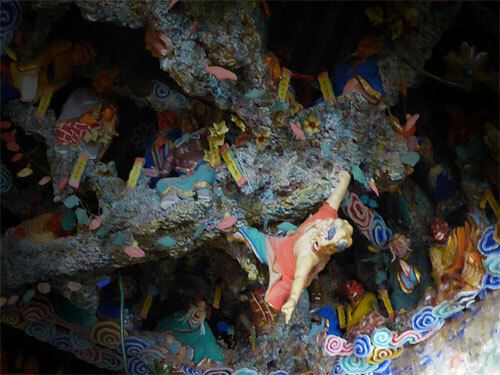 One of our favorites is a luohan in a colorful patchwork robe who is doing the splits in the air – with his feet on two rocks – while joining his hand in prayer Another swings on a tree trunk. 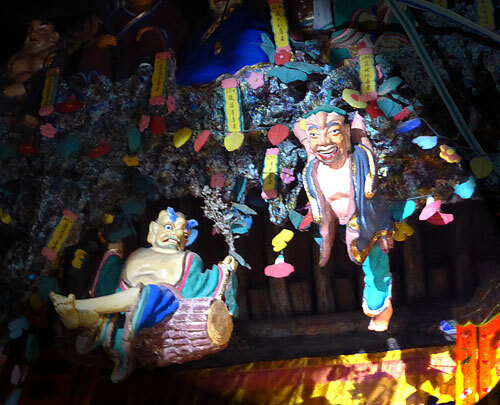 There are luohans swinging off the ceiling by one hand, a luohan that looks like a cross between Santa Claus (face and white beard) and Spiderman (red and blue outfit). 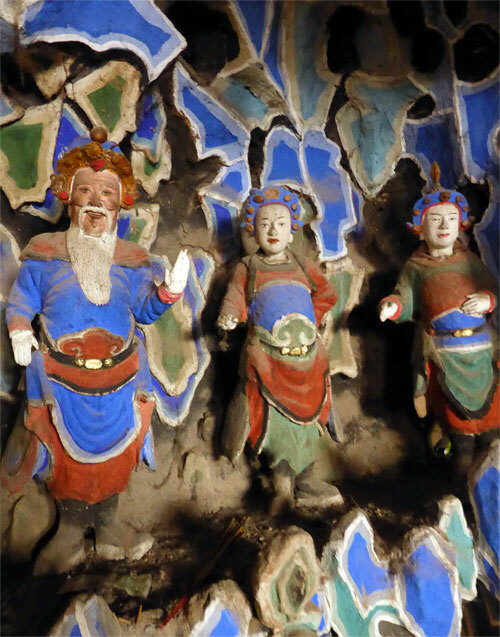 According to the monk there are 500 hundred of them and they date from the Ming Dynasty and were repainted 90 years ago; a process that took 10 years. 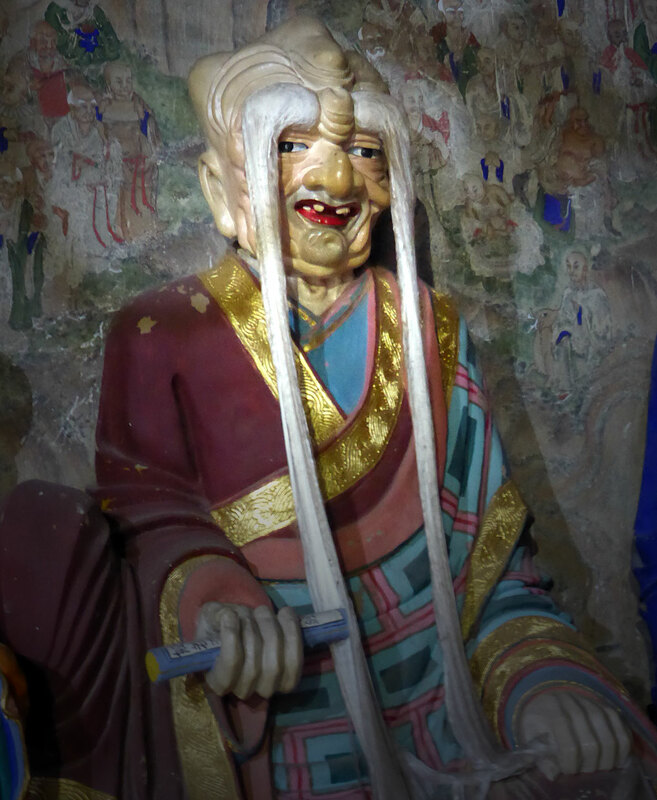 The Jinge Temple is about 14 km away from the central cluster of temples at Wutaishan. 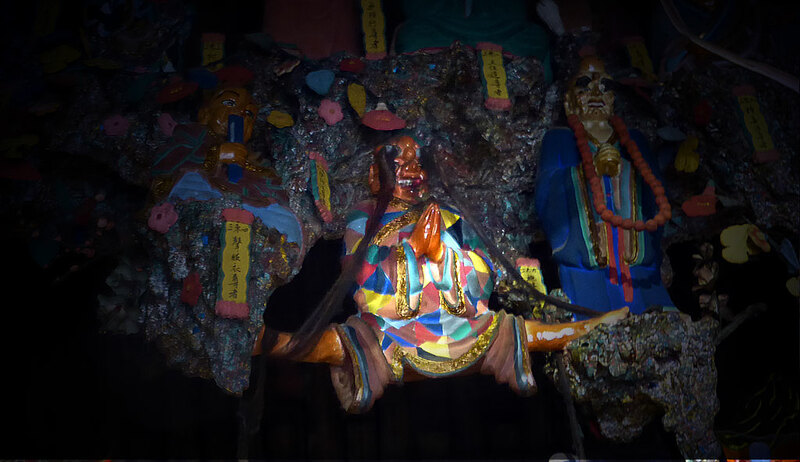 It’s on the same road as the famous Longquan Temple 龙泉寺 and in the direction of the historic Foguang Temple 佛光寺 (see future articles). 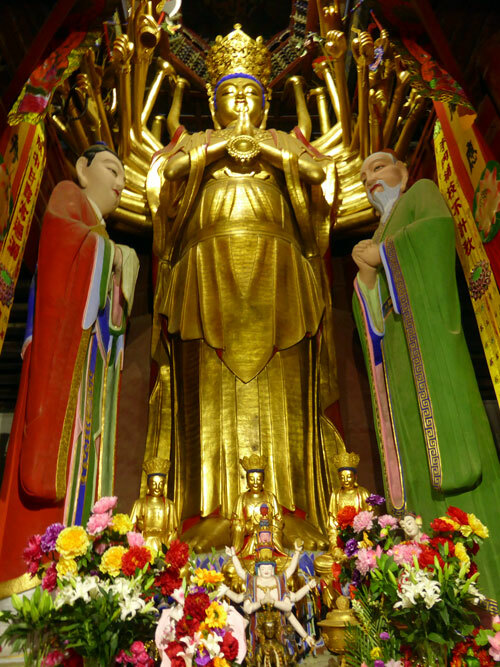 The temple has two main halls: The first holds a an amazing 85 ton, 17.7 meter copper statue of Buddha; the second tallest in China after the one in Dafo Si 大佛寺 in Zhending 镇定. 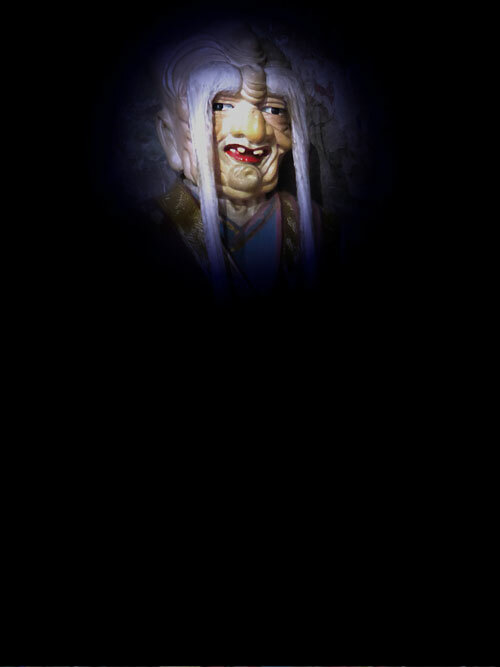 Unfortunately, despite having prayed to Buddha, I failed in my mission to capture the images in the temple. In fact, never have I taken such awful photos of such amazing objects. No matter how much I fiddled with the settings and lighting, the photos came out badly. 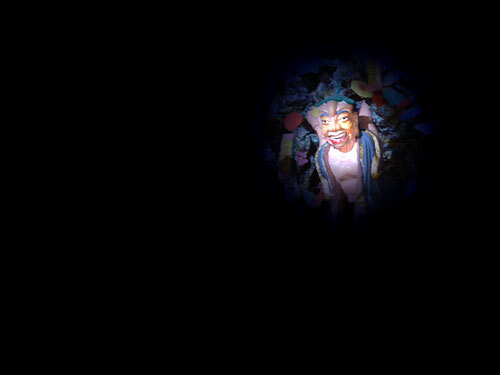 What you see here are the best of the worst. It obviously wasn’t meant to be. 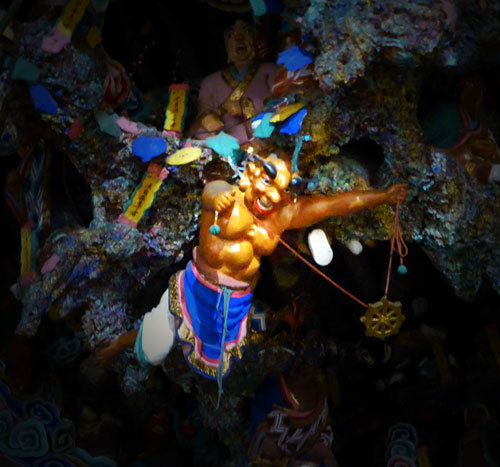 You need to hire a taxi: We picked one up for 60 yuan return from just outside the Nanshan Temple 南山寺. 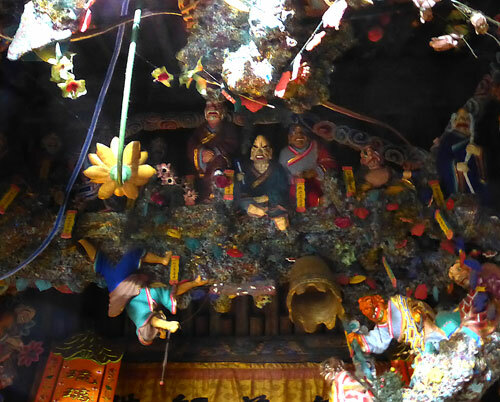 The driver will also stop at other temples on route such as the Longquan Temple 龙泉寺. 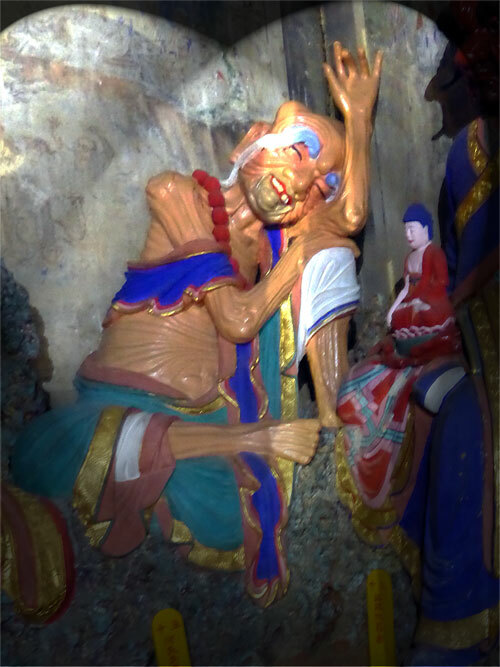 After having agreed on the 60 Yuan, the taxi driver suggested going on to the Foguang temple 佛光寺, some 40 kms out of the WutaiShan area. So we negotiated a full afternoon for 150 yuan. It was worth every Kuai. You can get to Wutaishan easily from either Taiyuan 太原 or Datong 大同. We went from Datong. Buses still leave from the main bus station in town. You don’t have to trek out to the new bus station despite everybody telling you the contrary. As with our first visit to Wutaishan the accommodation options weren’t anything to write home about. In fact, many hotels around the Taihuai area 台怀寺庙群 seemed to have gone downhill. No towels, sloppy cleaning, dodgy plumbing and damp seems to be the order of the day. However, cheap at 100 yuan for a double. Plenty of great opportunities to try various types of Shanxi noodles such as Cats Ears 猫朵。There appeared to be be fewer vegetarian restaurants than on our previous visit.